Skype has released a beta version of its software for Windows which includes a screen sharing feature. The Skype 4.1 release also reinstates some extras that were removed in the previous update – much to the disappointment of many subscribers. With the screen sharing feature, which is view-only, users get the choice to record the full screen or a region. It is also possible to shift between full and partial screen modes. With one-way viewing, the "guest" sees only the screen selected. 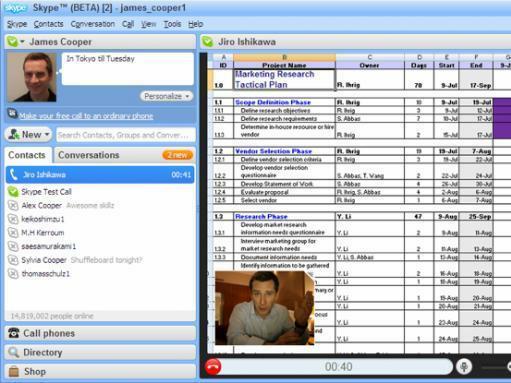 This addition moves Skype into the realm of low-cost international business communications, although it is limited to two users – host and guest. It would seem logical for the screen sharing function to be expanded in the future to group calls. Screen sharing was made available to Mac users in the last beta version of the Mac client in January – so Mac users now have the possibility of sharing screens with PC users. The Windows beta has also reintroduced two features dropped from the 4.0 version – birthday reminder alerts and contacts-sharing. The former simply send an automatic reminder on a contact’s birthday if this detail is available on their profile. Skype 4.1 also reinstated are a screen reader accessibility tool and a contacts import function from Gmail, Windows Live Hotmail, AOL and LinkedIn.